Time for a thrifty post, don’t you think?! Mom thrifted this box for me. It’s a little archive box that is so handy to have! 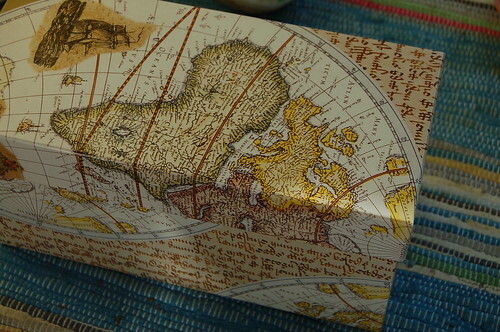 I really like the size and the patterned paper on it, I’m filling it with small pieces of collage ephemera. Neat-o! 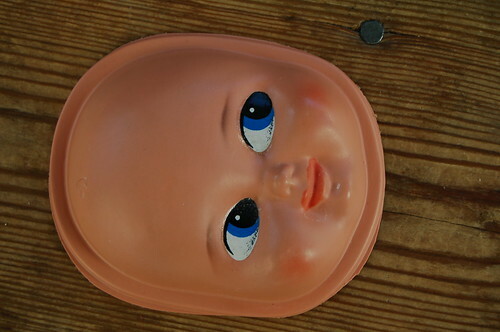 A doll head mom bought for me. I’ve haven’t been to that many thrift stores lately, but I thought I’d post the finds I’ve done today anyway. 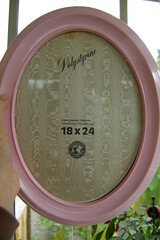 A pink plastic frame that was too good to pass for example. I love the color and shape of this one. I need to create something special for the inside. I don’t think I’ve ever created a piece of art for a special frame, but inspiration can come from anywhere so why not a frame? 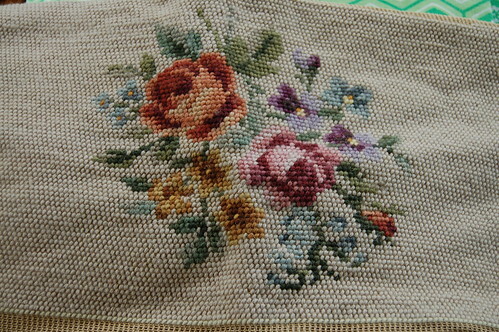 Vintage stool embroidery. So beautiful! 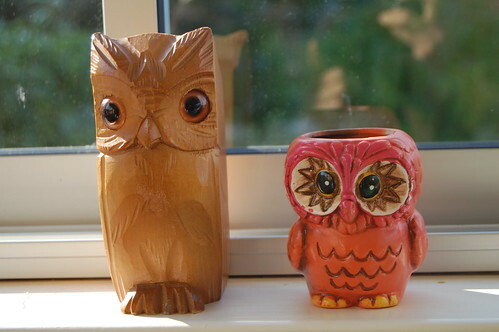 Carved wood owl that is a pen mug. Just look at those beautiful eyes, could you have resisted taking him home and letting him hold your favorite pens? I couldn’t. I wouldn’t. I picked him up super cheap and I will give him a good home. I was thinking that I don’t like the wood color and that I would paint him (white) but now I don’t know… Maybe I’ll ruin it? A vintage photo album that I have no idea how to use or what to do with. I just thought it was to bad that it would stay in the shop. I don’t like that kind of shopping, but sometimes I fall for that line in my head: “I’ll buy it and see later” even though I know I don’t really want to use it. 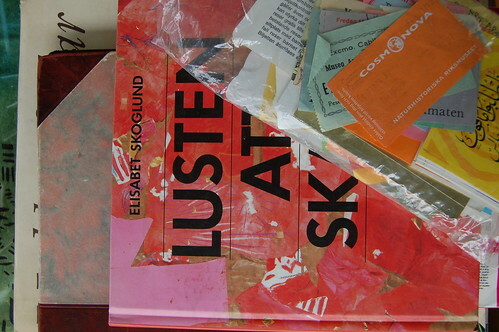 The book Lusten att skapa (the urge to create) is about how to encourage children to paint and the bag of tickets was one of my favorite finds in quite a while! That little plastic bag is filled with a whole life’s collection of tickets! It’s an amazing collection ranging 50 years back! I’m scanning a few of them and will post another blog post about this collection soon. Buddha! I had to take a photo of these to guys together, they look like they are dating or something… They are mom’s find and mom’s keeping them. Personally I prefer the slim Buddha that they make and pray to in Thailand. 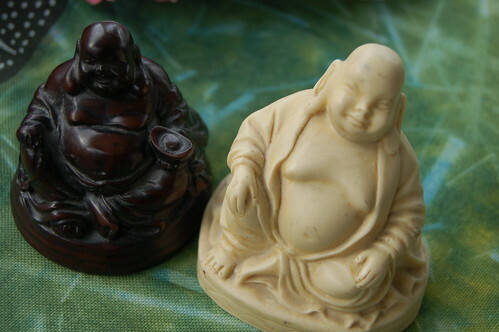 The fat Buddha is from China and mom adores him! Maybe that says something about our personality too. I know that the essence of his teachings is beautiful, how ever they sculpt him, and it’s something I want to learn more about in the coming years. A huge book of birds! The images inside are amazing and I’m planning to do bigger mixed media pieces with these images. A cool background and one of the birds as focal point, I think it could look really nice… If only I had the space and time to start this project today! Plus a English book about calligraphy. I just like the handwritten pages. 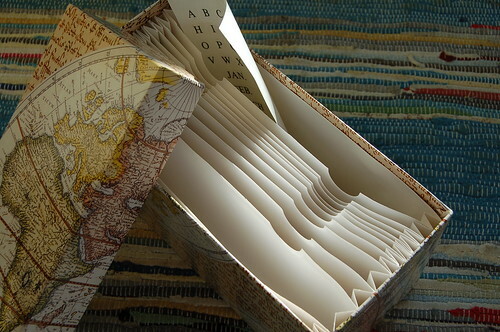 I haven’t decided if it’s a bookshelf book or a mixed media backgrounds book yet… Or both, first the first option and then I’ll “recycle” it later. Lastly a napkin holder with round holes that I think is rather ugly but could become something really fun with some decoupage and paint. I bought it just to play with it, I’ll see what I end up with! So, that’s it for today. Doesn’t it seam like it will be a fun day when I get around to these items? Reading that book, cutting out some birds, painting the napkin holder… But I know myself so I won’t promise it will happen this year! ;-) The last days of this year is passing by very quickly, don’t you think? What do we need to do until January 1th 2009? I need to start writing that list today! 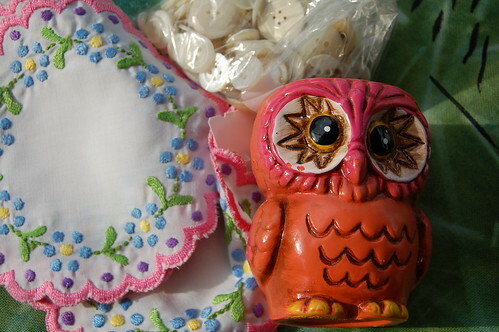 This entry was posted in Pretty things, Thrift & Recycle and tagged buddhism, owls, storage, thrifted finds. Bookmark the permalink. I love those little owls! We don’t have enough decent thrifty places in Cardiff, and certainly not enough places selling cute owls!!! Lots of fun and pretty things here. I love thrift store shopping! You made out like a bandit!!! … and it’s amazing to me that someone would even turn all those tickets in! What a great surprise treasure. Oh, how I covet those tickets! I could find a MILLION uses for them. 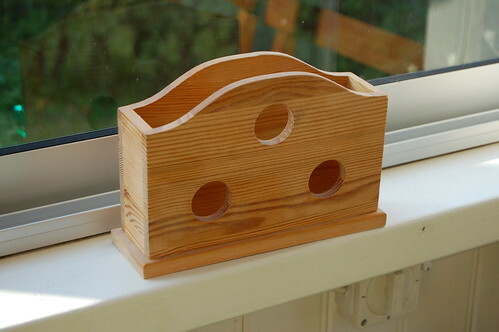 But for now, how about filling in the holes on the ugly napkin holder (papier mache would be quick but would it work? ), then sticking random tickets all over it like a crazy patchwork. 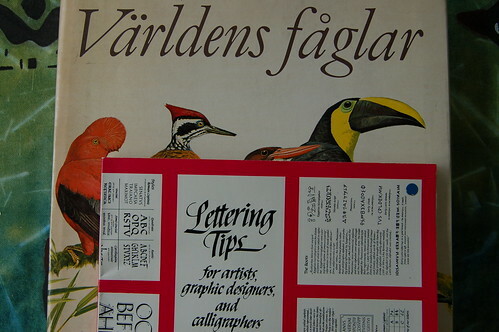 Then varnish/glaze it and you have a terrific new storage unit for letters…pens…paintbrushes….whatever. I can already see a row of bottles of glitter glue in mine! I need to get to the charity shop NOW!! I love the owls. I really love the owl candle holder. I would have screamed & snagged him right up if I saw him. I love everything. I like the doll head. Maybe you could turn her into something goth for your journaling.